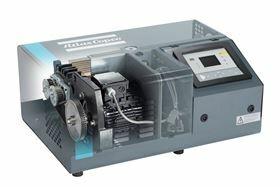 Atlas Copco's DHS 065-200 VSD+ dry screw vacuum pump offers zero contamination. Atlas Copco’s Industrial Vacuum division has announced the launch of its DHS 065-200 VSD+ dry screw vacuum pump which offers zero contamination and requires no water or oil cooling. Built for rapid cycling and continuous operation applications, the DHS VSD+ is certified as oil-free in the Class Zero category according to ISO standard 8573-1. The pump is free of oil emissions, including aerosol oil content in the outlet air stream. It has a reduced number of parts within the pump and a variable pitch screw design. The completely dry operation of the DHS 065 - 200 VSD+ means that no oil migrates into the pump environment, creating a clean and safe working environment. For applications such as vacuum drying and cleaning, paper converting, sensitive and regulations-driven electronics manufacturing and food packaging industries, there are no reactions with other process media or deposits inside the vacuum pump. The pump is equipped and controlled with the MK5 Elektonikon which links it to plant management systems, allowing users to receive status updates on running and stopped hours, warnings, fault and shutdown indications. Combined with Atlas Copco’s SMARTLINK, the pump also offers remote monitoring capabilities.